This study is the collection of the phonetically motivated or onomatopoeic words in Tamil and the classification of them on the basis of their formal and semantic functions. These words have been collected from the Tamil Lexicon. Tamil Lexicon consists of 117,762 words, including compounds and dialect variations and borrowing and 580 of them are onomatopoeic words, either single, reduplicated, or echo. This shows that 0.5% words are onomatopoeic in Tamil. 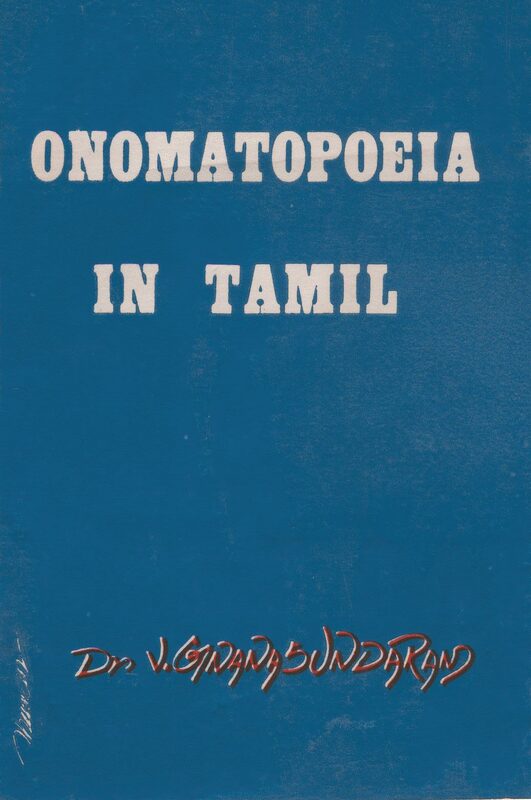 Note also that this Tamil Lexicon was compiled many decades ago, and so, the revised and proposed new Tamil Lexicon is bound to turn up with a greater share of onomatopoeic words. This monograph is divided into six chapters. the first chapter gives the onomatopoeic words that are single words. The onomatopoeic expressions that are not duplicated with or without changes are taken as single words. Because this monograph was published several years ago as a print version, there was no way I could have asked for an electronic copy. The PDF document is separated into distinct chapter documents for easy access and downloading.